As of April, 2015, we have launched a new web presence at WWW.RUSSELLMAROONSHOATZ.COM. There, we will be posting updates on Maroon’s health, legal efforts, writings, as well as related news, campaigns, and culture. If you are interested in contributing art, poems, essays, or articles to Maroon’s blog, please contact maroonconnect@gmail.com. We have also begun a brand new Email Announcement List. Even if you think you are already connected with us, please follow the link and sign up! For background on Maroon’s activism and imprisonment, please see his Case History on Our Website. “As a seventy one year old Political Prisoner I have spent over forty three continuous years in over twenty three jails, prisons and a maximum security mental institution, with over thirty of those years being held in solitary confinement. During that period … the most challenging health issues I have been faced with … fall in two categories: major difficulties with both eyes, and prostrate problems that have developed into prostrate cancer. Over the years I have struggled to PURCHASE large segments of medical records the prison and mental institutions compile on me. In the absence of a court order, no copies of these records have ever been available free-of-charge! On March 28th, we launched the Spring Maroon 2015 Book and Culinary Tour. We’ll be hosting community discussions based on writings in Maroon The Implacable, breaking bread with healthy food, and strategizing around Maroon’s recovery and freedom. Throughout the U.S., all spring long, Maroon’s son, Russell the III, will be leading these events, some of which will include smoothies made with the special ingredient “Maroon Moss,” a blend of sea vegetables, apples, kale and lemon! 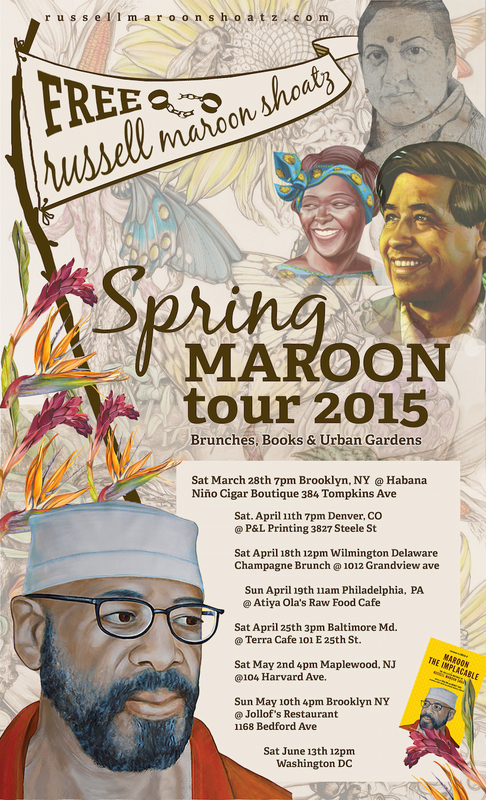 To see if the Spring Maroon Tour is stopping by a town near you, please see the Itinerary. As with justice workers across the globe, we are very concerned about the treatment of Mumia Abu-Jamal during his recent decline in health. We urge you to connect with the Campaign to Bring Mumia Home and to Donate to Mumia’s Health Care Fund. He needs independent, specialized medical attention, urgently. This is our major demand. We need to step up the pressure and oppose the attempt at state execution of Mumia by medical neglect. Free Mumia! Social Media ‘Get Well’ Shout Outs for Maroon! With the launch of the Spring Maroon Book and Culinary Tour, and our new online presence, we are asking supporters to send their thoughts to Maroon as he embarks on this medical journey. Your greetings can come in any form. Submit a spoken word piece, poem, music, rap, tweet, 30 second video, “get well” shout outs, etc. e-mail maroonconnect@gmail.com to have your greeting posted on the site, and/or tweet @RussellMShoatz. As we embark on a renewed fight to bring Maroon home, the time has come for us to reach out to you for financial support. The Shoatz family has been the primary funder of this campaign since Maroon was initially locked up in the early 1970s. In the simplest of terms, we don’t have the resources to continue being this struggle’s main financial engine. Please hit the PayPal link below to contribute. No amount is too little. Please also consider sharing this information with family members, friends, and colleagues who may be able to support. Follow this link for Democracy Now! UPDATE: Yesterday morning, March 30, Mumia Abu-Jamal was rushed to the hospital after passing out at State Correctional Institution (SCI) Mahanoy. He was admitted to the Schuylkill Medical Center with a blood sugar level of 779. Today, he received visits from his wife, Wadiya, and his brother, Keith Cook. Mumia’s blood sugar had dropped to 333 as of a couple hours ago. This is still elevated and at an unhealthy level. Mumia does not have a history of diabetes, but had been experiencing a series of symptoms that should have alerted medical staff at the prison to the onset of the disease. Instead, he was not given comprehensive diagnostic treatment and a medical crisis emerged that could have resulted in his slipping into a diabetic coma or worse. 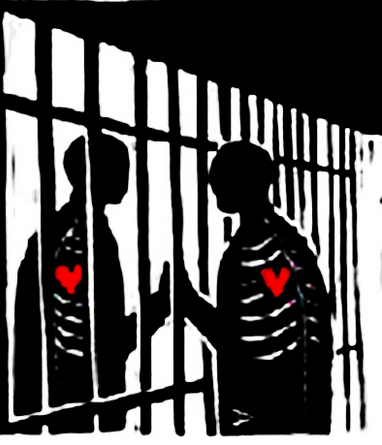 Prison officials only relented and permitted visitation under immense public pressure from all over the world. Keep it up. If the prison had its way, nobody would know Mumia was hospitalized, nor would they have permitted visits or the release of any medical information to family. Family and friends are not leaving Pottsville. Mumia is not out of danger and we will remain vigilant and mobilized. 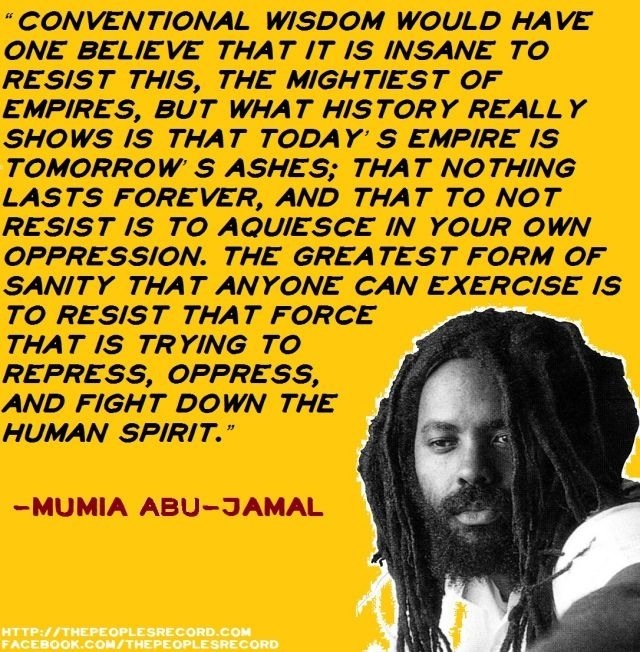 The state keeps trying to kill Mumia – spied on by the FBI since he was 15, shot in the chest and severely beaten on December 9, 1981, framed for a killing he did not commit and put on death row, held in solitary confinement under threat of execution for 30 years, and now denied competent, basic medical care. He is alive because the movement has fought like hell to make it so. The government of the united states of apartheid can never be trusted to protect the rights or respect the lives of Black people or those held in prison. Never forgive, never forget. Stay alert and ready to act. Free Mumia! Get well soon Mumia! WE LOVE YOU!! SMOKE MAROON OUT!!! SOLD OUT! The Kick off of The Spring Maroon Tour!!! Saturday April 18th 12pm Wilmington Del. “Champagne Brunch” 1012 Grandview ave.
Saturday April 25th 3pm Baltimore Md. @ Terra Cafe 101 E 25th St.
Free Maroon Senegal Sponsors Food 4 Thought! 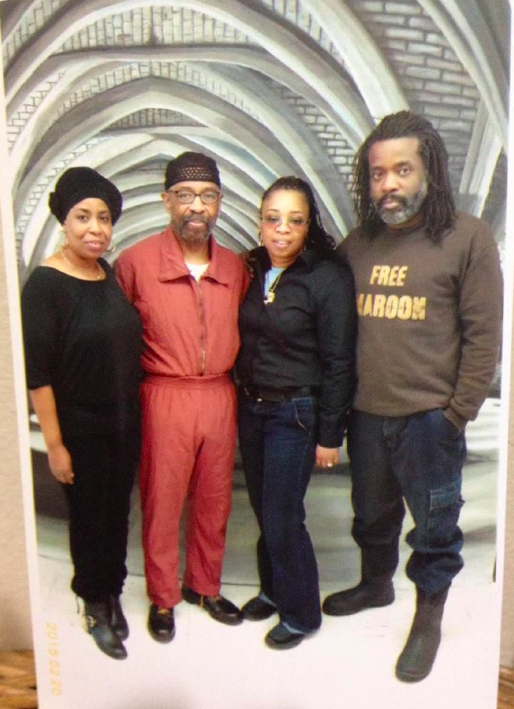 Yesterday marked the one-year anniversary of my fathers release from solitary confinement into the general prison population at State Correctional Institution (SCI) Graterford. This long-sought move ended over 22 consecutive years in solitary confinement. It also marked the first time that Maroon had been in the general prison population in the state of Pennsylvania since 1983, when he was placed in solitary confinement due to his work with the Pennsylvania Association of Lifers to abolish life-without-parole sentences. For a 17-month period between 1989-1991, Maroon was held in the general prison population at the federal penitentiary at Leavenworth, Kansas. Maroon brought suit in May, 2013, on the grounds that he had been subjected to cruel and unusual punishment in violation of the Eighth Amendment to the U.S. Constitution, and that prison officials had deprived him of his procedural and substantive due process rights for keeping him in solitary confinement without meaningful review and on insufficient grounds. He is represented by Reed Smith attorneys Rick Etter and Stefanie L. Burt; Bret Grote and Dustin McDaniel of the Abolitionist Law Center; Daniel Kovalik of the United Steelworkers; and retired Reed Smith partner, Hal Engel. On Monday, January 27, 2014, United States District Magistrate for the Western District of Pennsylvania, Cynthia Reed Eddy, issued a decision denying defendants’ motion to dismiss in the case of Shoatz v. Wetzel. The ruling allowed Maroon to move forward with the legal challenge to his more than 22 consecutive years in solitary confinement. While Maroon’s release from solitary confinement proved a significant step forward in the campaign to free him from prison altogether, our work to bring him home continues. As many of you know, Maroon was recently diagnosed with prostate cancer, and was being denied adequate medical care. An emergency phone and letter-writing campaign directed at the Pennsylvania Department of Corrections resulted in the onset of an aggressive course of cancer treatment. The Shoatz family wishes to thank all those supporters who answered the call and advocated for Maroon. We’ll be keeping you abreast of developments in his treatment, and ask that you remain vigilant should the need to further advocate regarding his medical care in the coming weeks and months reemerge. Hold the Phone! Maroon’s Getting Treatment because of YOU! UPDATE: Human Rights Coalition sent out an action alert Tuesday morning regarding Russell Maroon Shoatz, the former Black Panther and political prisoner. Maroon had been informed that he has prostate cancer on December 9, 2014, and treatment has not yet begun. PADOC medical contacted the Shoatz family this morning and informed them of the course and schedule of the treatments that Maroon is going to be receiving for his prostate cancer. The treatment is set to begin this week. THANK YOU to all who answered the call and advocated for Maroon. At this time we are asking supporters to hold off on further phone calls and letters. Maroon’s family and legal counsel will be in communication with him to ensure that he begins receiving the treatment without any further delay. We cannot thank everybody enough. Hold off for now on further advocacy, but remain vigilant in the event that further action is required in the future. This entry was posted on Sunday, April 26th, 2015 at 11:57 am	and is filed under Other Articles. You can follow any responses to this entry through the RSS 2.0 feed. Responses are currently closed, but you can trackback from your own site.